Are you mystified by mile-a-minute patterns? I know I once was but this book has cleared up all of the confusion! 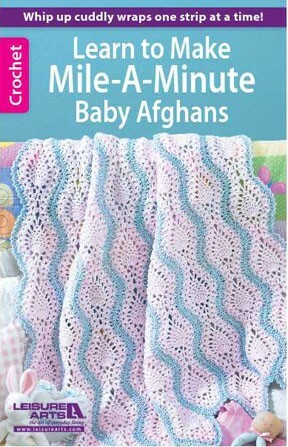 This little book has six baby afghans that are made in the mile-a-minute style. Right away I was so glad that this book explained just how the mile-a-minute pattern is created. Basically you crochet a center strip and then you work a border around this strip. Then all you have to do is connect multiple strips to make the afghan. Awesome! You'll have to check out this book to see just how each part of the strip is created. This basic principle of crocheting in strips is applied to each of the six baby afghans in the book. What's amazing is that each patern is still so different from the next. It just goes to show you how versatile crochet can be! Win the Baby Blanket Collection! Enter to win a copy of Beginner's Guide to Crochet Motifs!